Is it possible that a somatopsychic effect exists in which the health of the body (soma) affects the health of our brain (psychic), thus influencing learning and cognitive function? Our social, economic, built, and even weather environments have changed dramatically over the past three to five decades. Physical activity is the positive approach to weight control. When you decide to do something about your weight, you are committing to a course of action. 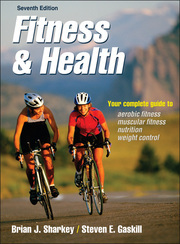 Textbook for undergraduate students taking courses covering topics related to general fitness, exercise, physical activity, health, and wellness; a reference for fitness professionals and fitness enthusiasts.